We try and be as environmentally 'green' as we can be. All our packaging is re-used or recycled. We have not used ANY new boxes or packaging for over 10 years!! Any 'flo-pack' used is biodegradable, invoices are emailed, no delivery notices are printed, we're virtually paper and print free. TrophiesandMedals.com has re-structured the business and all orders must now be placed online. We are still awaiting the launch of new websites so for now use this site and add any notes and queries to the order in the Delivery Notes section. Your queries can then be dealt with more efficiently this way. Emails will be reviewed only after web orders. If you can't find what you need online then we will add these items upon request for you. Welcome to TrophiesandMedals.com - You have found one of the earliest online retail websites that is still trading ... we started business as an online company in 1999. We have always had our trophy home based close to London. The trophy business started in the garden shed and the first paid employee was my father-in-law which took him out of working the markets. I'm proudest of that above all else. Read more about the story at About Us and in the meantime please feel free to call us if there is any trophy you want that you can't quite find as we have 1000's more available offline. TrophiesandMedals.com has one of the widest selection of trophies and awards available to purchase online 24 hrs a day, 7 days a week with over 3500 products. We off this wide range from multiple suppliers because we think choice is one of the most important things we can give you. In addition we do everything in house so we can offer fast engraving and free delivery on most orders. TrophiesandMedals.com prices most of its products at or below brochure prices. 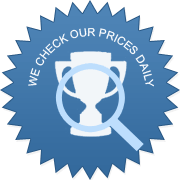 We understand however that you will want the best price as well as service and so, if we are ever more expensive, we will almost always price match given appropriate proof. More importantly though we want to provide the highest quality trophies for your budget, so feel free to let us know what it is and we will offer you the very best for your money. TrophiesandMedals.com provide a complete range of school trophies and awards, and medals for all your school sports day and prize-giving awards. As well as a full 'Follow-On' engraving service where we can collect, engrave and return your annual trophies. You can buy with confidence knowing TrophiesandMedals.com have been established since 1999, we believe we are the oldest and the best online trophy supplier. We have a full range of trophy and award engraving services and all trophies are engraved on site. This means we take responsibility for the engraving and the trophies and your trophy order is always in our control, not with a 3rd party like so many other trophy retailers. If you need any help contact us - that's what we're here for. A school in Kent emailed at 4am and rang at 8am as they desparately needed a host of rugby trophies for their rugby tournament the next day on Saturday! An RFU decision on 'no winners' meant trophies had not been ordered but the school decided at the last minute that they should present some awards, quite rightly too! TrophiesandMedals.com came to the rescue and organised rugby medals, ribbons, glass rugby awards and resin rugby trophies along with engraving, which we do in house, and these were sent on a Saturday AM service ... this is the sort of last minute trophy rescue we do all the time ... it's almost never too late!